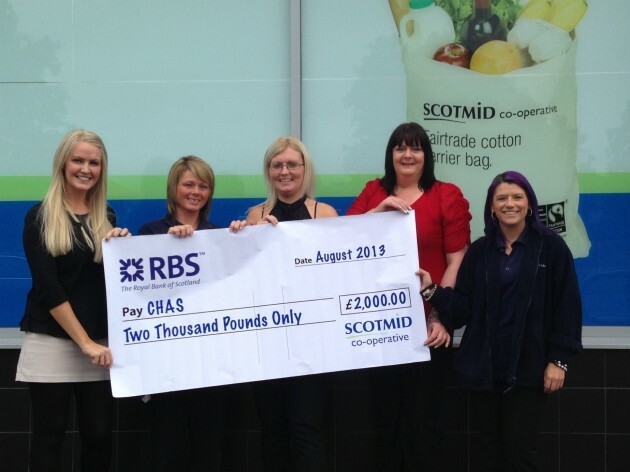 Grace Wilson from CHAS accepts a cheque from the Scotmid Alexandria team. Scotmid customers in West Dunbartonshire have raised £2,000 for Robin House Children’s Hospice in Alexandria through the sale of carrier bags in local stores. Grace Wilson from the Children’s Hospice Association of Scotland (CHAS) visited Scotmid’s Alexandria store today to accept a cheque from staff. Local Scotmid stores charge two pence for de-gradable plastic carrier bags, with 100% of the profit pledged to charities and community groups. Since Scotmid introduced the charge in 2011, £56,750 has gone to local causes. Robin House Children’s Hospice is a purpose built ‘home from home’, providing a hospice service for children and young people with life-shortening conditions and accommodation and support for their families. The charity will be using the donation from Scotmid to fund the services and support they provide for families.